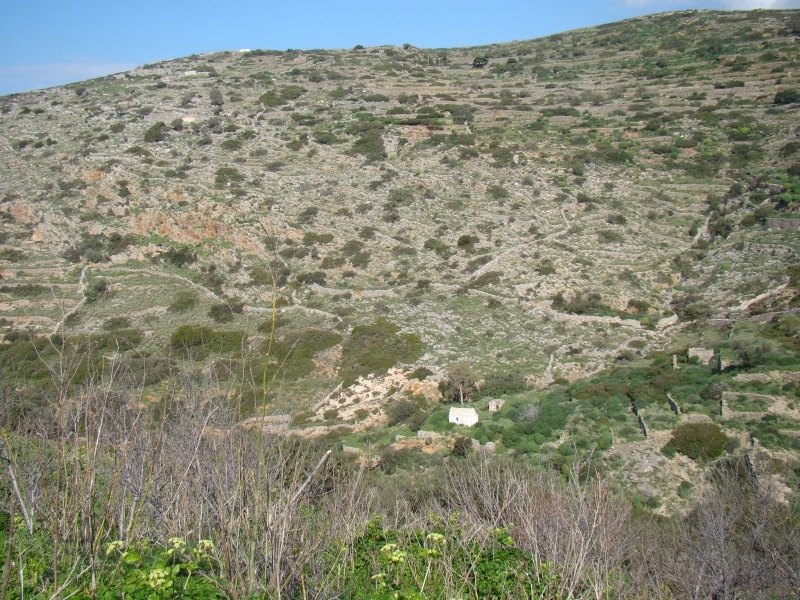 The cache is close to side of the old donkey path down from the capital Chora to the main port of Katapola. The path is very easy underfoot and downhill all the way. The Capital of the island, Chora, was first inhabited in the 9th century AD with the nucleus located in the area surrounding the Kastro rock. During the Venetian period fortified houses were built around the Kastro, which are supposed to have secret passages leading to the castle. The view from the chapel is very spectacular but care should be taken if it’s windy. The path leading up to the Kastro consists of 5th century BC dressed stones, which probably came from a nearby temple. Over the centuries Chora has spread out and they say it was purposely built as a labyrinth to confuse the pirates and to get them hopelessly lost. From the heliport in Chora there is a path which goes down to the port of Katapola. There are many springs on the way down. The cache is in a plastic drink container with a yellow top. It just contains a log and a geocaching declaration in Greek and in English. Please take a pen with you. Additional Hint: A cache guarded by frogs.